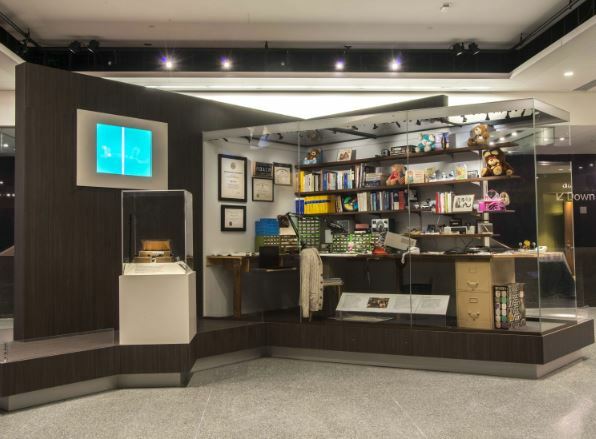 Ralph Baer's basement workshop was taken from his Manchester home and is now in the Smithsonian's American History museum. The geek canonization (so to speak) of Ralph Baer continues to gather steam. Officials in Manchester are scheduled to hold a dedication ceremony on May 10 of what will become, unofficially at least, Ralph Baer Plaza in Arms Park, on the bank of the Merrimack River next to the Notre Dame Bridge. It will feature a statue of Baer, who led the team, with Bill Harrison and Bill Rusch, that built the first home video game (the Magnavox Odyssey) while working at Sanders Associates (now BAE) in Nashua. The ceremony may draw folks from the Smithsonian Museum in D.C., which has Ralph’s basement workshop on display in the National Museum of American History. I first heard of Ralph Baer when his book “Videogames: In the Beginning” landed on my newsroom desk in 2005. He had written it partly out of irritation at all of the attention given to Nolan Bushnell, who is often called the “father of video games” for developing the coin-operated Pong game – which happened well after Baer did his work. In the decade since then, Baer, who died last December at 92 at his Manchester home, has been awarded the National Medal of Technology in a White House ceremony, inducted into the National Inventors Hall of Fame, had the workshop from the basement of his Manchester home turned into an exhibit in a Smithsonian museum in Washington, D.C., and in perhaps the biggest honor for somebody happiest with a soldering iron nearby, has been named a fellow of the IEEE, the professional organization of electrical engineers. On Monday, another honor came his way in the parking lot at the Canal Street branch of BAE Systems in Nashua, the defense contractor descendant of Sanders Associates, where Baer worked. A plaque was unveiled honoring the development in that building of the “brown box,” the unofficial name for the first console that turned one-way television into an interactive medium via what was marketed in 1972 as the Magnavox Odyssey. The plaque marks the accomplishment as an official IEEE milestone event. Manchester is clever to encourage this as part of its branding as a tech center.